September 10, 2014 -- DUBAI - Greater consideration should be given to a woman's total quality of life in the breast screening debate. That was the take-home message of a keynote lecture by Dr. Rola Shaheen at this week's International Congress of Radiology (ICR 2014). Quality-adjusted life year (QALY), a measure of disease burden, is used to assess both the quality and quantity of life lived. It's typically used to assess the value for money of a medical intervention, and should be a key part of the screening debate. All women have the right to know the truth about breast screening, argues Dr. Rola Shaheen. "Chemotherapy is not a walk in the park, so if I can discover a tumor that's 1 cm in diameter as opposed to 5 cm and save my patient from chemo, then I'll be the happiest person," Shaheen pointed out. "Yes, saving a life is good, but saving a woman from chemotherapy is also our target, whether she is young or not." 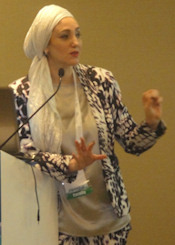 Shaheen is chief of women's imaging at Mafraq Hospital in Abu Dhabi, United Arab Emirates (UAE), and is also a radiology instructor at Harvard Medical School in the U.S. She spoke on 10 September. Another key controversy is the screening of women between the ages of 40 and 49, for instance whether a younger patient who might have invasive ductal carcinoma will benefit from breast screening, even though she has a more aggressive disease pattern and will probably die anyway. "The answer is 'yes and no,' and it depends on the type of cancer," Shaheen said. "Can you tell from the mammogram or the look of the woman if she's going to have aggressive or nonaggressive cancer? That's not my job, that's not your job. Our job is to do the screening." For the small percentage of women who are unlucky, at least the tumors are discovered early and hopefully the new improved treatments will take care of them and give the women a chance of life, Shaheen said. Is the well-being of women a priority? Or is it political? She stressed that she is not a statistician, an epidemiologist, an economist, or a health policymaker, but she is a breast imager who is dealing with patients and colleagues who are confused. Also, she describes herself as a potential target for breast cancer, and like all women in the world, she has the right to know the truth about breast screening. Breast cancer awareness campaigns in the Middle East must target men, as well as the health authorities and physicians, believes Dr. Ashraf Selim. 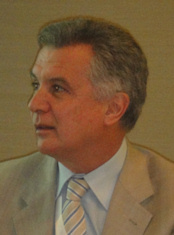 In addition to training and education, promoting awareness of breast cancer among women is a particular concern in the Middle East, according to session moderator Dr. Ashraf Selim, professor of radiology and head of women's imaging at Cairo University in Egypt and chairman of the Ladies' Health Alliance. "They are afraid just to mention the name cancer. They refrain from going to screening projects because they're afraid to face the facts," he said. "Even if we discover something and we tell them we need to take a biopsy, they escape. That's the real problem." Greater awareness is also essential among men, as well as the health authorities and physicians. Another vital factor for national screening programs is to have a figurehead and a champion, such as the first lady of a country, to encourage participation, Salim said. A three-day conference about breast cancer in the Arab world is taking place in Amman, Jordan, from 27 to 29 October 2014. Click here for details. For our gallery of photos from the Dubai meeting, please click here.